"Fuel your body...Delight your senses"
Stephanie grew up in an Italian family and Italians are passionate about life! Every aspect of life is important to them: living, loving, spirituality, family, food, and all things cultural. Stephanie is an American Heart Association award winning Registered Dietitian (RD) and NY State credentialed Certified Dietitian-Nutritionist (CDN). With solid expertise built over more than three decades of practice and spanning six states, Stephanie's background includes being a seasoned clinician, consultant, educator (including full-time professor), presenter, author, researcher, program coordinator, consumer scientist (including recipe developer), advocate, counselor, coach, and mentor. Our mission is to offer a blog that encourages you to expand your sensory enjoyment of tasty food, rich in vital nutrients, to help you maximize your health and enjoy a flavorful life. See it, Smell it, Taste it! Welcome to Sensory Nutrition! Please come in and join Stephanie and the rest of the staff here. The doors at Sensory Nutrition are usually open 24/7, so come in and visit with us when YOUR schedule allows. We would love to share some of our secrets for nutritious and delicious meals you can make as part of your busy 21st century lifestyle. Whether cooking for one or for many, our motto is: Get more out of life and enjoy life more. Let food be your source of nutrients to fuel your lifestyle and delight your senses! Springtime conjures up images associated with the season of specialty chocolate bunnies, Easter chocolate eggs, and more. Easter is coming on March 31, 2013 (except for those who belong to the Eastern Orthodox Church and celebrate it on May 5, 2013). 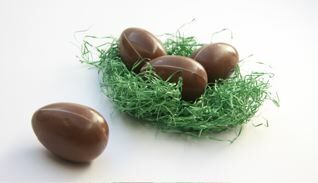 Image of chocolate eggs courtesy of gesinek at rgbstock.com. As Lent ends, often consumers look at engaging in some type of chocolate indulgence. Those of the Jewish faith in the USA who celebrate Passover from sunset on March 25, 2013 through April 2, 2013 may also consider a Kosher chocolate indulgence as well. If chocolate has been properly stored, then the item(s) should have no “chocolate bloom” once any packaging is opened. If it has been improperly stored, however, then “chocolate bloom” may be evident. Will that chocolate bloom put a damper on the experience? The National Retail Federation expects Easter candy sales (of all types of candy, including chocolate) to top 2 billion in 2012. Let me preface the following remarks by saying that the females involved in running the sensory nutrition blog site appreciate really good cacao sources as much as any other real women, but as with all such goodies, moderation goes a long, long way combined with a dash of common sense. A little high quality chocolate will provide more intense sensory enjoyment per kcal so if you treat yourself, why not make every bite count?! Now if only fruit & vegetable sales for the Easter holiday were also measured in the billions with steady double digit growth most years! FYI–as an aside, you can find a curious view comparing the sugar content of filled candy Easter eggs (as sold in the USA by a well-known manufacturer) to the sugar content of a 12 oz. can or 20 oz bottle of soda pop here). 1. 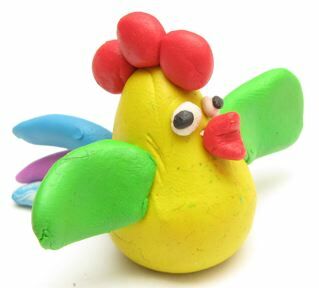 A Gluten-Free Play Dough (aka play doh) recipe is available at the Celiac Kids Recipes website (courtesy of the Celiac Sprue Association) as of the date of this blog post. Please consider that if a child (or an adult who plays with a child!) in your circle either is sensitive to gluten or has gluten enteropathy, or plays with another child (or adult!) who might need to remain gluten-free, this could be a worthwhile consideration. 2. A Celiac Disease Screening Tool is being offered by the joint efforts of The University of Chicago Celiac Disease Center, along with The General Mills “Bell Institute of Health and Nutrition” and General Mills brand of Chex cereals (gluten free), that is available to the public through the Gluten Freely site. Diagnosis of any medical condition goes beyond initial screening, of course, but awareness can sometimes be the first step to obtaining a full screening and eventually an applicable diagnosis. It can be beneficial to focus on known factual information, not rumor or pop culture fiction. 3. A listing of potentially Gluten-Free candies for Easter time from 2009 (with some updates in 2010), including chocolate products, is listed at Heather’s “Celiac Family” site. Although we don’t promote willy nilly candy consumption, the reality of life is that children of all ages may be drawn to Easter candy and it is better to be as informed as possible about options. As always, PLEASE check labels carefully, since manufacturers can change formulations and processing without prior notice in many instances, as that way you can avoid anything that might potentially contain gluten in it or have been potentially subject to cross-contamination with gluten. 4. After Passover, sometimes there are sales on “Kosher for Passover” items which might happen to be gluten-free. NOTE: “Kosher for Passover” is different than standard Kosher designation so do NOT confuse the two designations! Purim cleansing of any residence of anything Chavetz means all leavened products are removed from the residence for that time. “Kosher for Passover” items are unleavened and thus typically Gluten-Free, however, again, PLEASE check labels carefully, as always, so that you avoid anything that might potentially contain gluten in it or have been potentially subject to cross-contamination with gluten. Our thanks to Cheryl Harris for mentioning this. 5. An informal gluten-free menu swap is hosted on the www and over time has moved around a bit in terms of where you can find the archived information through the most current listings. Years back it started with Natalie’s Gluten Free Mommy site; and then moved over to Cheryl’s site of Gluten Free Goodness; and since Oct 17, 2011 is now housed at Heather’s Celiac Family site with some previous weekly schedules also available there. March is National Nutrition Month(NNM)! Springtime marks a time of renewal for individuals throughout the world on so many levels. People look forward to celebrating it in a variety of ways, including those who will choose to celebrate Easter and others who will commemorate Passover, etc., in April this year. In this two part article, we will focus on Celebrating Easter in Part 1 of 2. Part 2 of 2 will focus on Commemorating Purim through Passover. There are a wide variety of tips that can enable almost anyone to enjoy healthier version options of favorite recipes should you decide you want to explore updating them. Some of these tips might be applicable and appeal, depending upon whether or not you need to consider any other special diet restrictions for medical or other reasons. As always, please check with your medical professional when it comes to matters pertaining to your individual health or that of your family members. Remember that we only offer infotainment on this site. Besides the tips below and elsewhere on the www, there are also various cookbook options with recipes by others, etc., for purchase, should you wish to pursue adding any new paper cookbooks to your physical book library or eBooks to your electronic library. When it comes to food choices, any decision is always yours to make. Some individuals without a specific medical condition to the contrary may be able to and choose to allow themselves a little indulgence one day and make up for it on some other days. We fully respect your right to follow the approach that works for you!